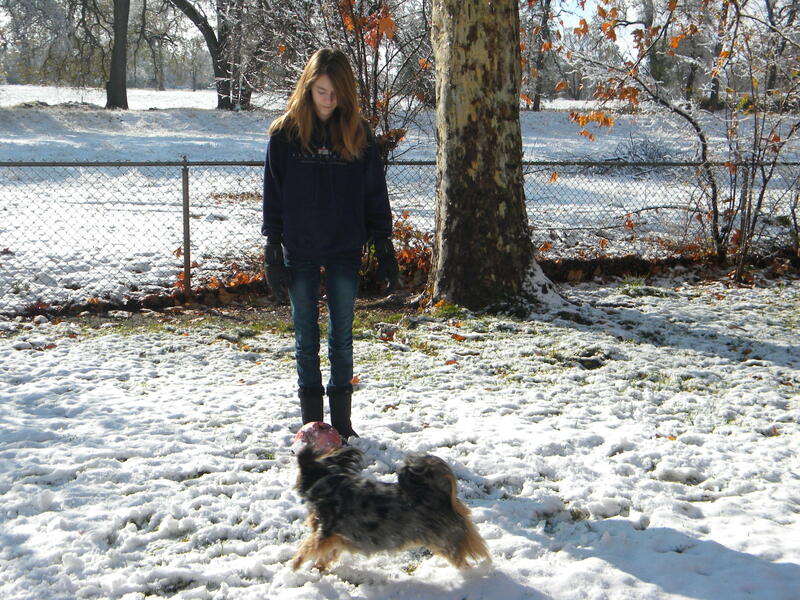 We got a really great snow that year!! We get at least one good snow a year. 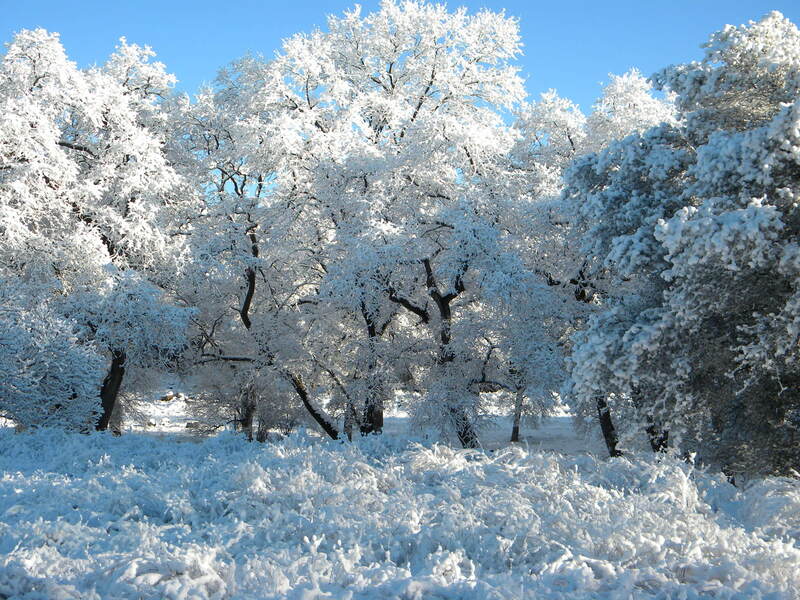 The weatherman is predicting some colder temps this weekend and possible snow which is really unusual for this time of year. 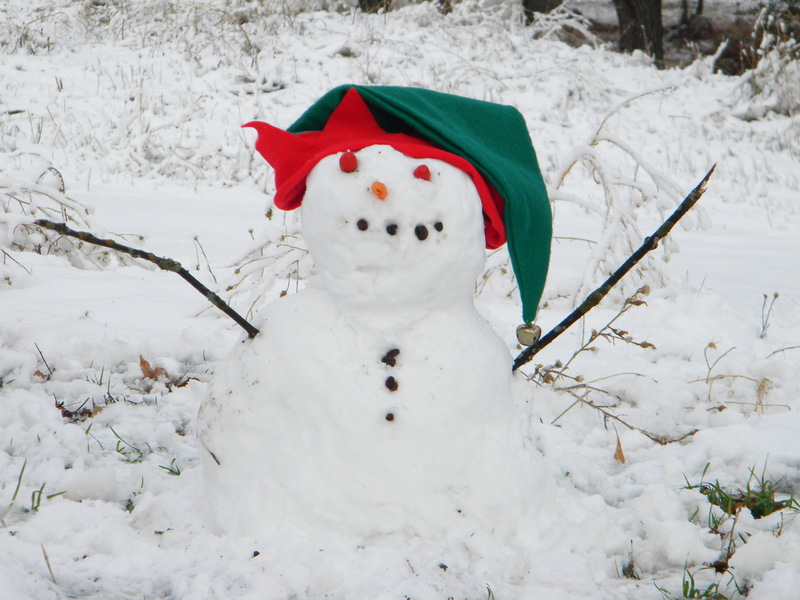 We usually don’t get snow until January or February here, so we’ll see…. 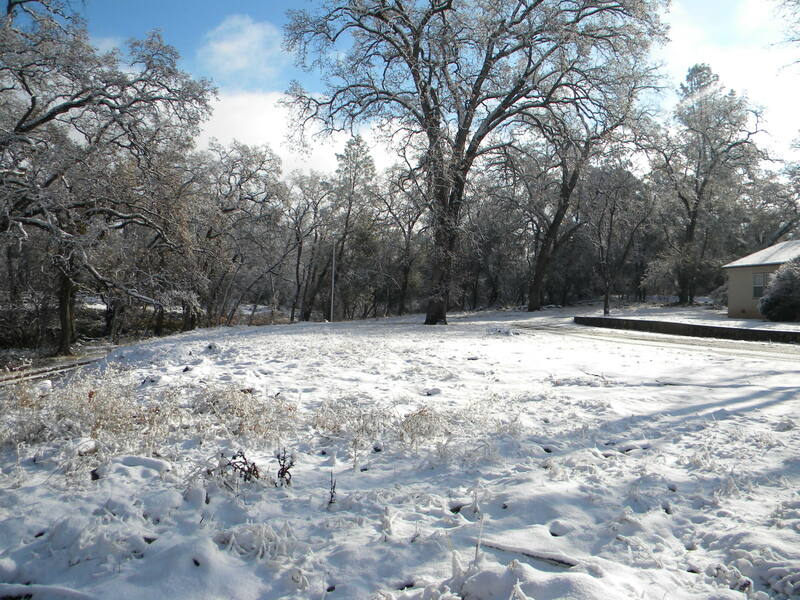 Last night after dark we received an early snow, our first, this year! 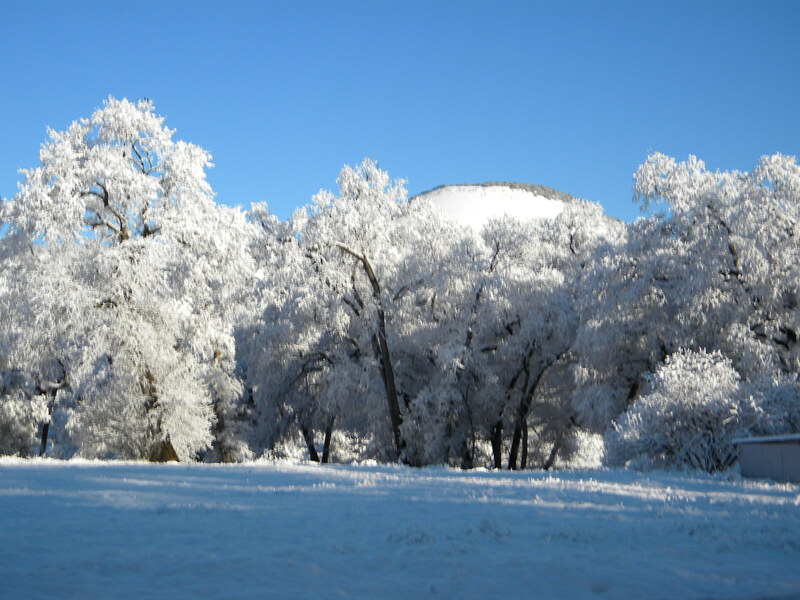 The weatherman was saying we were going to get snow in Redding which is over 30 miles away, but most of the time when they get snow, we don’t! We got a nice surprise, though, when a couple of inches fell by about midnight. 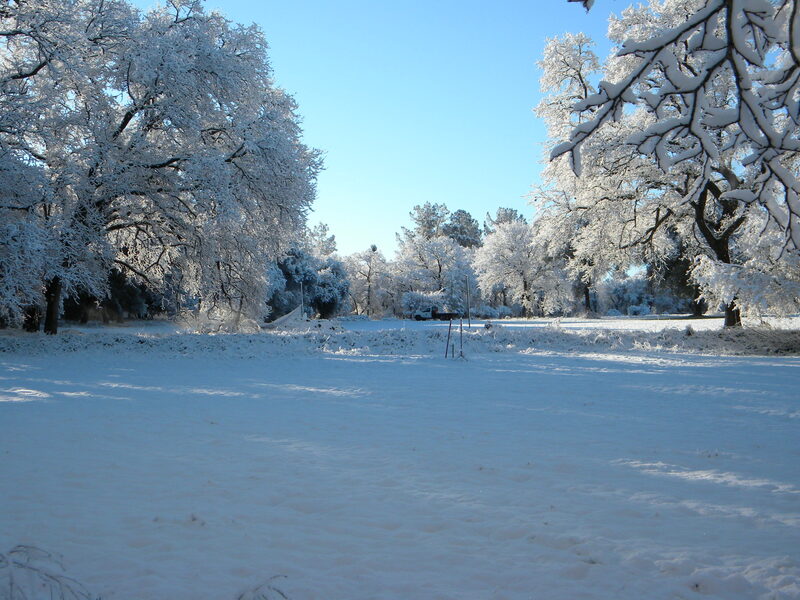 Redding received several more inches, and up in Manton where our church is, they received about eight inches. 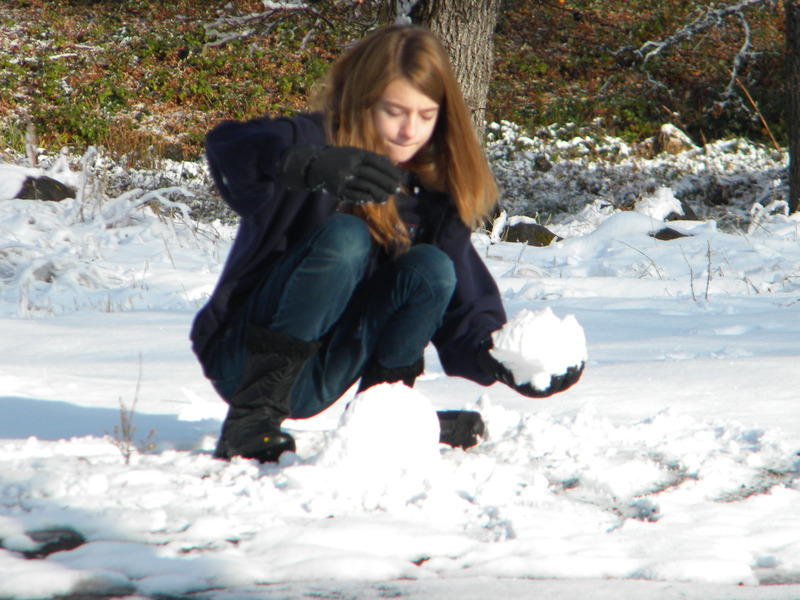 So I took a few pictures of Grace playing with our dog Brownie and building a small snowman. It is beautiful and sunnier now, though, so I’m not sure if it will last through the night. Have a wonderful day everyone and give someone you love a hug. I Can’t Wait to Get on the Road Again! This is called the Flood Road. It’s a shortcut to Manton from where we live, but it is too rough on the car, because it isn’t paved! And this is a shot I took by the huge turnout. These flowers were in the yard of the bed and breakfast that my family and I went on vacation to in Crescent City, CA, last summer. It’s a beautiful place with wonderful hosts! Check it out! Eventually I plan to do a painting of them. I Created a Path of Stepping Stones! Yesterday my kids and I finished a “small” landscaping project. Well, my son may not have thought it was so small since he had to do a lot of preliminary digging and lift so many bags of decorative rocks for me! We have a huge patch of ground next to our driveway that has never grown grass. Every year it is a muddy mess during the rainy season. 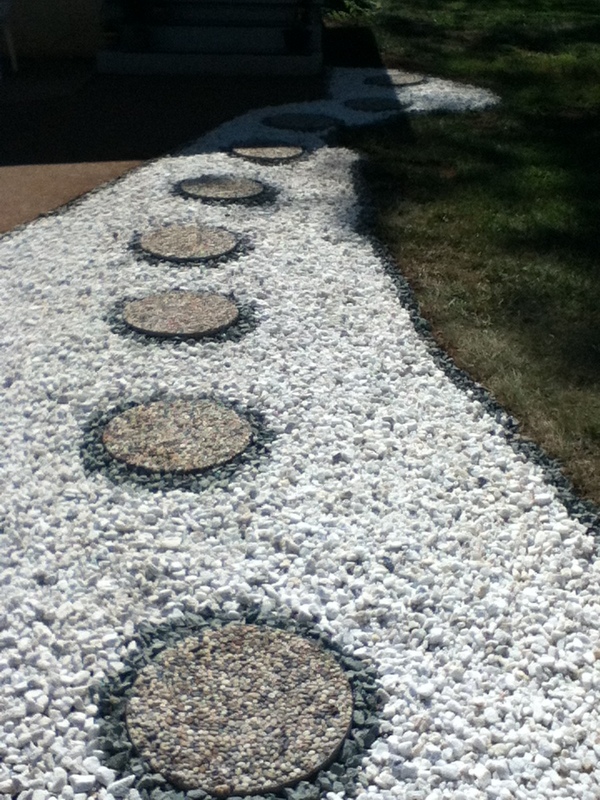 So I decided to make a path of stepping stones from the middle of the driveway up to the front porch. I bought nine round pebbled stepping stones, 15 bags of white rock, and two bags of green rock. After we laid the stones down, we put the green rock around each one a couple of inches out from the stones. Then we laid in all of the white rock and finished off with the green around the border of the whole space. It has brightened up the yard tremendously! Also, I had bought one extra stepping stone that we decided not to put down as part of this path, so my daughter suggested putting it in front of our front yard’s water faucet which leaks a little when the sprinkler is on. (Yes, I have a sprinkler I have to move from place to place.) We should probably replace that faucet handle, but just haven’t gotten around to it yet. Back to my story – we placed the last stepping stone about a foot in front of the faucet in a spot that will not grow anything. Even my lupin hasn’t spread there yet. It probably has tree roots under the ground that are interfering with it. So we put more white rock around the stepping stone and in back of it all the way to the faucet and underneath the faucet about a foot to catch the leakage. It looks really nice and brightens up the middle of the front yard! The last thing my daughter and I did today was rake out another section in the backyard near our huge redwood tree. I bought some white clover seed the other day to try to use as a ground cover back there. So we planted almost a pint of it so see if it will take. Then we spread some potting soil on top so the birds won’t find it. Hopefully, it will come up soon! It would look really pretty if that whole part of the yard could grow clover since it is close to the fence and near the redwood tree. I had thought about putting a horseshoe pit in front of that tree, but our TV satellite dish is in one corner, and one wild pitch could take it out! I’d like to put some horseshoe pits in, though, somewhere! It’s a fun family game. And I don’t believe my kids have ever played it! I used to play it all the time about 30 years ago. Unfortunately, some of the plants I put in the yard aren’t doing as well as I had hoped they would. My Begonias and my Foxtail Fern are growing well. But my Mother Fern was dying where I planted it. When I dug it up, it hadn’t even started getting rooted in the ground since I planted it over a month ago. Perhaps it was a bad fern to begin with. I’m not sure. I also planted some Coral Bells. They were doing okay, but I’m not sure if I overwatered them. Their edges began drying out, too, so they may be getting a little too much sun even though they require part sun. I’m not sure why the Foxtail Fern has done so well there. It had the same planting requirements as the Coral Bells. I guess this has become a learning experience for me. We live in a very hot place and have had some pretty hot weather over this last month. So perhaps I just planted some things too late in the year. This Fall I plan to try and put some Daffodil bulbs in the ground next to the stone pathway we made. I hope I will see them in the Spring. As soon as I figure out how, I plan to post a picture of our stepping stone pathway. This blogging stuff is all new to me, so please be patient with me! Have a wonderful summer day wherever you are and give someone you love a big hug! I used to think of art as just drawing, painting, sculpting, that sort of thing. But I have come to learn that art is a general name for so many different types of creative things people can do! For instance, I have seen yards at some homes that are done by landscapers who are very artistic at what they do. And often those landscapers are the people who live in those homes! What some people can do with flowers just blows me away! That is one art I want to learn…soon! I don’t have a landscaped yard. In fact we have many patches of dirt in the lawn where grass won’t grow for some reason. This year I wanted to change all of that. First, I began to weed the front yard where some funky plants grow. They have a unique flower in the middle of three heart-shaped leaves; only I have no idea what they are. But they’re cool, so I wanted them to stand out. I proceeded to pull up all the weeds around them and cleared out all the leaves. We have huge oak trees here and lots of leaves to deal with. Then I noticed that the rose bushes needed trimming. So I did that. And as I went along, I began to find these great ferns that I never noticed before! I’m telling ya, there’s a small portion of our yard that looks like a little jungle. In fact, my 14 year-old daughter can hide in there! Then I trimmed some smaller trees and a lilac bush. And I began to think about what kinds of flowers I could plant. Next I went to the library, because frankly I know practically nothing about gardening. All I know is I want a yard that’s nice to look at! I checked out several books about gardening and although I didn’t read them cover-to-cover, I learned a few things. I already knew pruning helps things grow better. And it’s true! I pruned all the bushes and low and behold, they are blooming new roses and beautiful new leaves! So that was a plus. Then I bought only two potted flowers. (I didn’t want to spend a bunch of money only to possibly kill them! That was smart, if I do say so myself!!) I bought a small pot of mums. They’re pretty, right? I didn’t really have a ready spot to plant them in the ground yet, so I decided I would keep them on our porch. I transplanted them into a slightly bigger pot. My daughter even painted it all pretty and bright! But after a week or so, they died. What did I do wrong? I HAVE NO IDEA!!! But the other flower I bought is a flower that grows well in the shade. I have a huge shady spot on the side of the house. It’s called a Cyclamen. We put that one in the ground right away. It has beautiful magenta flowers and unique leaves. So far that one is doing okay. I’ve noticed that some blooms died, so I pinched them off. And others are blooming. So maybe I’ve done something right! I pray for our pretty Cyclamen. After all, I need all the help I can get!